Seabass wrote: And both the data packs too, right? [s]Ah no, how/where do I get those from? Got latest download pack from within the "Information" menu in PES. Copied over the data from the "Saved Data Utility" within the PS3 menu. Thanks for the hard work that went into this file. Downloaded yesterday and am very happy with it. Have both 360 and PS3 so thought I'd try them both. Especially like the detail in the Emirates Stadium with the boards that go around the tiers displaying the years Arsenal won trophies. Wouldn't know that this wasn't an offical stadium in the game. One of the Pros about the editing options for the Ps3 compared to 360.
please proevo, is possible to post one link for download just your stadiums files export? I followed instructions, when I go to my Game Save Data folder on the PS3 home screen and than in my USB it was Empty, there are no more files which i download. can you help me ? xaraza - have you installed the data packs? if so, have you installed both DP1 and DP2? I've recently moved to Japan and I'd like to install the option file here. I have the Japanese version "Winning Eleven 2013" and I understand this OF is for UK (or EU) only, but I'm wondering if any knows if it works in Japan as well? Or, if not, does anyone know of some Japanese enthusiasts who have created one? Please, I'm in serious problems. I downloaded 2 version of OF for my PS3 Pro Evo 2013, but it doesn't work at all. The first one was the USA version WENBUS, and now the V1.0 that you guys put to be downloaded. I don't now what is happening, because i follow every steps discribed by you. And, when I start run the game, everything seems to be good, but I receive This message " Os dados não podem ser carregados porque foram criados por outra versão, baixe a versão adequada" (eng: The data can not be loaded because it was created by another version, download the appropriate version). My game version is BLUS 31029L, Neymar and CR7 in the cover, and Brasilian Portuguese in the commentaries. The PS3 is CECH2106B (O button is used to confirm and X button to exit). Alexc4Angola - you say you live in Angola, that could be a problem. I'm not an expert with all this BLES code mess, but I don't know if EU, US or Asian option files will work on your African game. Here's a question for you though; have you downloaded Data Pack 1 and Data Pack 2? You'll need these data packs for the option file to work I believe. Answering your question, I actually didn't downloaded the dp1 or dp2, I've read in some others sites that it can be a problem, some, I would do it today. I was looking for it in the internet straight to the PC, but I've noticed that it can be done only straight to the PS3. I'll let you know if something change after that. One thing, there's no PES 2013 special Africa edition, we usually use the version which come in the market first, my version is the American one. With CR7 and Neymar in the cover. Thanks again, and i'll be in touch. Hi I need major help, everything seems to be perfect apart from I dont have logos on all epl kits and other leagues for example arsenal has no fly emirates or nike logo, I dont understand as I did everything correct , what is wrong here! Nrcricardo wrote: Hi I need major help, everything seems to be perfect apart from I dont have logos on all epl kits and other leagues for example arsenal has no fly emirates or nike logo, I dont understand as I did everything correct , what is wrong here! I am having the same issue as is my friend, what is up? Here's the full file (V1.0, V1.1 + V1.2). Now, do I copy them like that into the right folders? I apologies if it's a really silly question. TheGas - yes, that looks fine to me. 5. 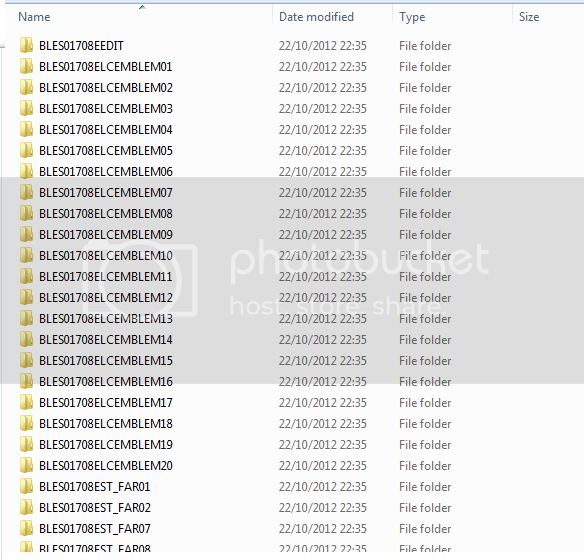 Put the OF into the SAVEDATA folder, so on your USB you will have PS3> SAVEDATA> all the folders from the OF.